You will be given a reference e-book to read which has 193 pages And the test will be based on that e-book , you can take final test within 1 year of purchase. What does Video Game Writing Entails? If obtaining a writing career in the video gaming industry is one of your major aims, then you should know how important it is to take up a video game writing certification course when it comes to honing your skills in this field. Video game writing is quite different from the process of writing short stories or novels. Although a career in short story or novel writing also requires a high level of skills, talent, creativity and passion, you will notice that video game writing is more complex especially if you are still starting out. You have to be creative enough to put words into the mouths of the most popular characters in some of the most famous video games at present. It is also important for you to play the games and love them as this is the only way for you to breathe life into your video game stories. Writing for video games is also proven to be different from any other writing genre because the story’s interactive nature requires you to completely understand the gamer experience. It should also be noted that video game writing has two major components. The first one is the flowchart which is capable of laying out the decision-making process of the video game while also showing the different logical paths that a user can take. The second one is the prose script which works in describing in detail what happens into the story. You have to learn about these two components with the help of a writing for video game course to become a successful video game writer. Honing your skills in writing scripts for video games is now possible with the presence of the video game writing certification program from Brainmeasures. Brainmeasures has already received its ISO certification and this guarantees you that the video game writing certification course that this online certification company offers is detailed enough. It covers all aspects linked to video game writing including the effective development of plots, setting and characters and tips in creating the perfect storyboards and scripts. Video game writing requires a lot of skills and knowledge so the comprehensiveness of this certification course from Brainmeasures can definitely offer you the kind of help and training that you need. 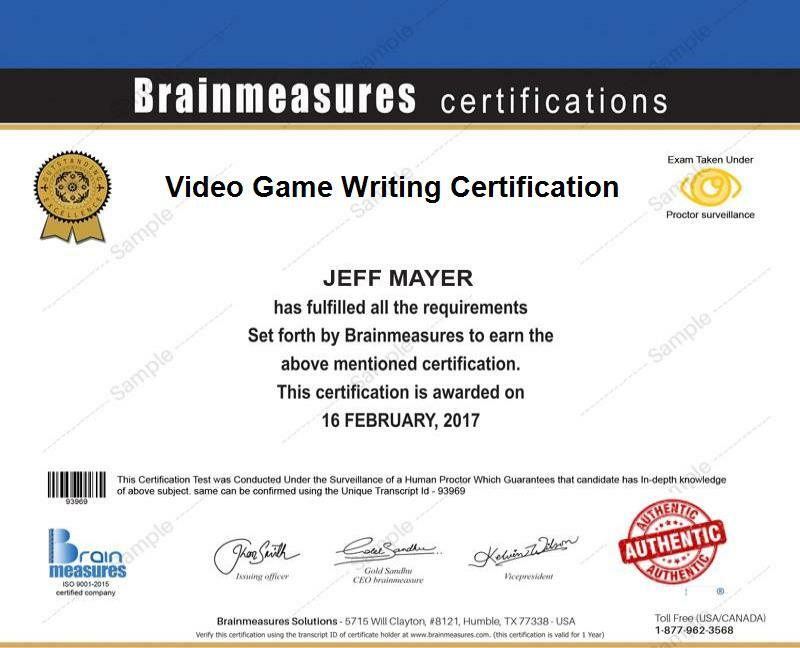 The video game writing certification program from Brainmeasures will never be complete without its video writing exam. This online writing test is developed to assess the level of your knowledge and skills in video game writing and to determine if you already deserve to get your certificate in this field. The video game writing certification program from Brainmeasures targets a lot of individuals. This is not only designed for writers who have already gained enough experience in other fields of writing but also for novice writers who wish to start a career in interactive writing through creating scripts and stories for video games. This certification course is also useful for project managers and producers who are responsible in planning game development schedules in the finest details and in assessing the value of the video game stories submitted to them. As a video game writing certification holder, note that you will never have a hard time earning a huge amount. If you are still new in the industry, then you can expect your annual salary to start from $60,000. Video game writers who have more experience in the field can expect to earn from $150,000 annually. You can further increase your income by taking part-time jobs as there are a lot of organizations in the gaming industry that require the service of freelance or part-time video game writing certification holders.